Explore our large selection of leatherette jewelry display pads & risers and show your collections in an elegant way! 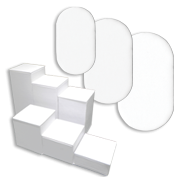 Shop the best risers for your store, in many shapes - round, square, hexagon or plain. Get the best prices thanks to our wholesale deals and transform the way you sell your pieces!